Installation: Tower Lifts lift engineers provide bespoke and standard installations of passenger lifts, goods lifts and platform lifts. This includes lift wells, lifting gear, ancillary equipment, fit out and user training. Maintenance: Regular lift inspections on all electrical equipment, gears, hydraulics, motors, drive systems, brakes, doors, locks. Our West London lift engineers will carry out ongoing repairs, diagnose problems and schedule in larger repairs. Refurbishments: Our lift engineers regularly carry out replacements or upgrades to lift equipment, or lift interiors. We also provide aesthetic upgrades which include panelling, flooring, buttons, controls panel, displays and finishes. Emergency Call Out: Our dedicated emergency response team will be available promptly if you experience a lift breakdown. They’ll manage the situation, diagnose the problem and get the lift up and running immediately if possible. Why not get in touch with our friendly customer service team today on 01525 601099 to find out more on our extensive lift solutions and service? 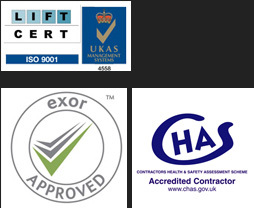 One of the things Tower Lifts lift engineers relish is the sheer range of clients we work with day to day. Our weekly schedules will normally incorporate the installation of a platform lift in a public building to facilitate disabled access. We’re also likely to be working with businesses to solve logistical problems using vertical transport. And we work with a range of domestic clients, installing home lifts and then offering regular maintenance. 1. Size? This busy clothing store, situated in Carnaby Street, wanted a dumbwaiter lift installed. The vertical transport was required to provide automated access to the warehouse, rather than taking store assistants away from customers. We provided a 5 stop model which moves goods from the basement to all five floors of the shop. 2. Manorgrove Homes: We recently completed the installation of a customised passenger lift for a converted Georgian house in Ickenham, Uxbridge. Manorgrove Homes managed the luxury refurbishment which now offers 25 luxury 2 and 3 bedfroom apartments, set in 8.5 acres of beautifully landscaped gardens. 3. Selfridges Food Hall: This iconic West London store asked Tower Lifts to install a duplex lift to carry fresh food ingredients from the food bay at ground level, up to their world famous food hall. The lift was required to carry both goods and passengers, and to provide a weight limit of up to 2,000kg. Needless to say, reliability and durability were key to this installation. At Tower Lifts we take pride in both the range of work our lift engineers cover, and the breadth of experience they bring to their work. We’ve worked on lifts in every conceivable context and, with every job, we become more valuable to our customers. What doesn’t change over time is our focus. Whether we’re refurbishing, maintaining or installing a lift, the safety of passengers sits at the heart of everything we do. If you’re looking for a West London lift engineer, call Tower Lifts today on 01525 601099. Our expert team will be able to offer you prompt advice and support.